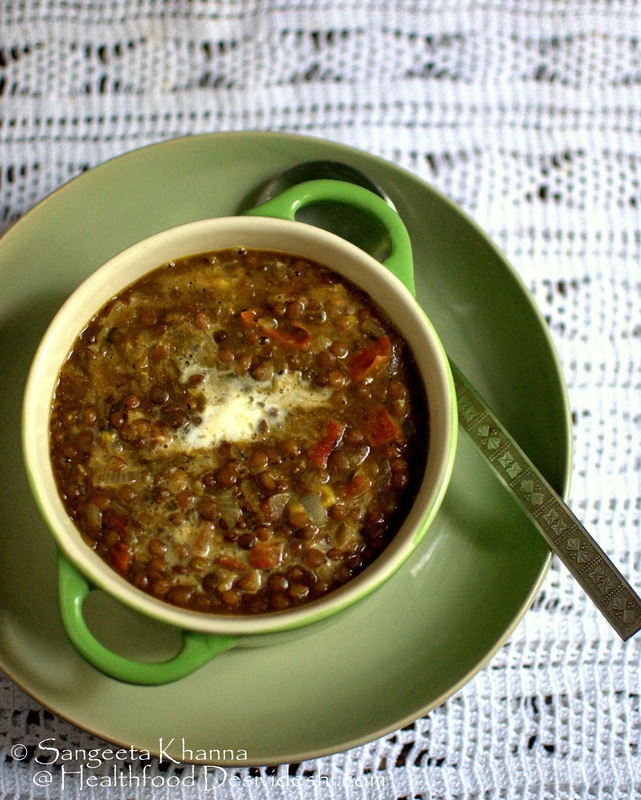 Sabut masoor ki daal used to be a frequent dinner time daal back in my parents' home. For some reason peeli arhar ki daal for lunch and sabut masoor ki daal for dinner was almost a ritual that we grew up with. Winters brought a lot of matar ka nimona and masoor ki daal ka nimona or even palak ka nimona that I have not cooked since ages, but we came back to square one in summers. The same peeli arhar ki daal and masoor ki daal routine we followed religiousely but I don't remember anyone ever complained. I think we were a bunch of extremely active-growing-hungry kids who would get even more hungry when the dining table was laid out. I think one reason why sabut masoor ki daal was so frequent on the table was that it came from the village grown organically for the family. I can well understand now why my parents wanted to use the home grown lentils to the fullest. I remember papa would cut salad, would prepare the jars of pickled onion and ginger-garlic and there would always be some freshly ground green chutney at the table. Hot daal with home made ghee was another standard presence at the table that everyone looked forward to. Simple real foods that become a habit and comfort, far from ordering a pizza meal that many associate with comfort food these days. One can always make better choices I say. So this sabut masoor ki daal remained the comfort food forever. The husband is not too fond of it but he likes it for a change. 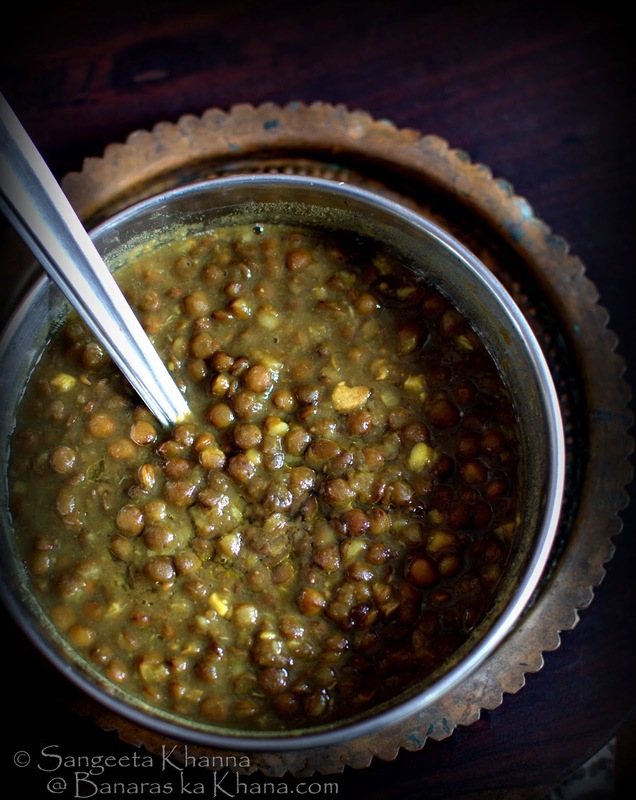 I eat my sabut masor ki dal religiously,silently and mostly like a one pot meal. I am sharing one of my simplest one pot recipes first, the tadka tempered recipe is next. I cook both the recipes as per convenience and mood, also depending on whether the daal is to be served to guests or to ourselves. For ourselves I like the quick simpler version more, lighter and milder on spice quotient. Topped with a blob of butter or ghee. Put all the ingredients together in a pressure cooker pan and add 1.5 cups of water. Add salt to taste and 1 tsp *ghee and close the lid. Place on the gas flame and cook till the first whistle blows. Lower the flame and cook further for 8-10 minutes. Let the pressure release by itself. Open the lid and stir the cooked daal once. Adjust consistency by adding water or cooking a bit more to make the daal thicker if you wish. Add the remaining 1 tsp ghee and serve hot. You don't even need to garnish it with dhaniya patta or anything. Add more ghee if you wish and can afford health wise. More ghee is bad ONLY if you eat a lot of it and that too not for clogging your blood vessels but by adding extra calories to your overall daily food intake. The tadka tempered version of the sabut masoor ki daal would cooked simply with salt and turmeric powder in the pressure cooker as stated above. A tempering will be prepared and added to the cooked daal and simmered for 5 minutes before serving. Some milk and cream would be added to make the daal more 'dressed up for the occasion' if the daal is being served to guests. Not to enhance the taste but to dress it up to look good. To make a tempering masala for the spiced sabut masoor ki daal..
For 2-3 servings of the daal, heat 1 tbsp ghee in a pan, add 1/2 tsp cumin seeds and some chopped onions, fry till onions get pinkish but not brown. Add 1 tbsp ginger garlic paste and fry till it all looks glazed. Add 2 tsp coriander powder, 1/2 tsp pepper powder, red chilly powder to taste and let it all sizzle for a second. Add a little garam masala and 1/2 cup chopped tomatoes. Add bit of salt and fry till everything gets mushy. Pour this mix into the cooked masoor ki daal and simmer till everything gets incorporated. Add 1/2 cup milk or 2 tbsp cream if desired. Let it come to a boil again. Serve hot garnished with whatever you like. 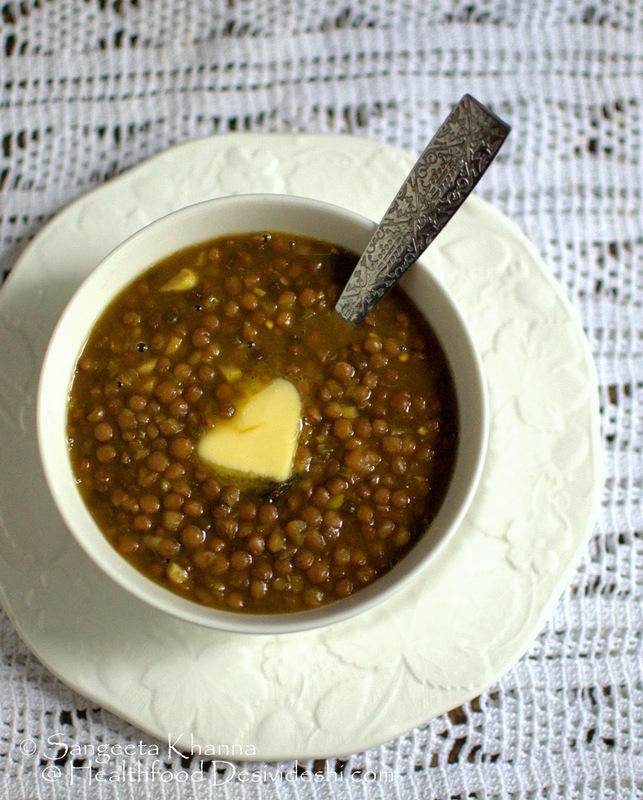 A blob of butter or a dollop of cream goes a long way to ensure everyone is smitten with the daal. I like some ginger julienne but skip adding it if the other side dishes are hot. The best part with this daal and many other daals that I cook is, that I use the leftovers to create a favourite breakfast of mine. Daal dhokli made with leftover daal is the best ghee laced breakfast for me to start the day. Just dilute the daal with equal amount of water. You need about 3/4 cup of cooked daal per serving. Roll out a chapati using multigrain dough and cut the rolled chapati into small square pieces. Mix everything together and simmer till the thin pieces of chapati get cooked. It takes about 5 minutes total. 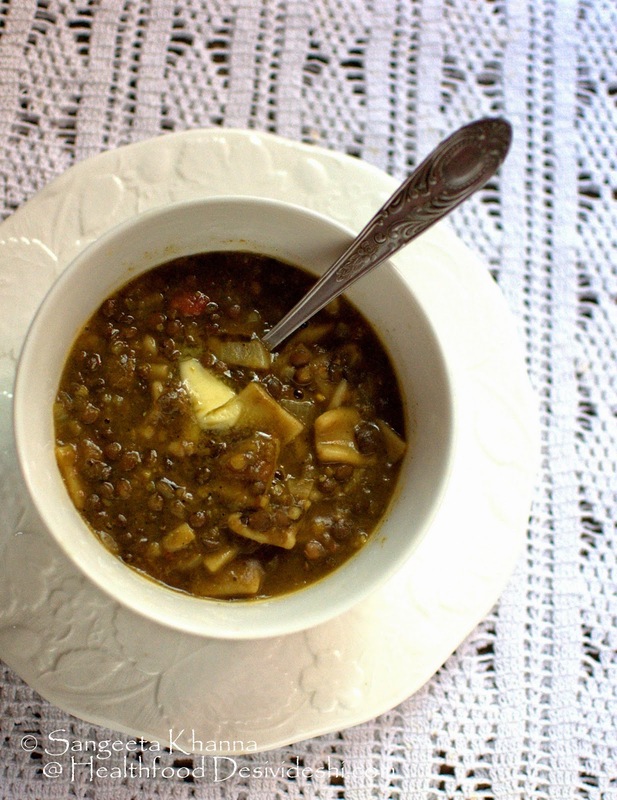 This is just like pasta in a lentil soup. Trust me this curried lentil pasta will be much more loved than a regular pasta in a soup. Try once if you don't believe me. Sabut masor ki daal will be your favourite too. Or probably it already is. It already is Sangeeta! My favourite :) I know some people who havent even tasted this before I offered them the same. Including my husband! And he loves it too now. I love it when you describe your childhood memories with such simplicity. there is a smooth flow in your narration which really takes me back to mine. This indeed sounds very yummy.